Niagahoster Review 2019: Is Niagahoster a Good Hosting? Established in 2014, Niagahoster in Indonesia has rapidly risen through the ranks in just a few short years. They’re now amongst the top three hosting providers in the country with over 30,000 registered users on their network. Niagahoster was established in 2014 in Jakarta, Indonesia. This web hosting company is now one of the top three hosting providers in the country with over 30,000 registered users on their network. Niagahoster primarily serves an Indonesian customer base. Niagahoster’s ability to offer superior hosting performance stems from their Tier 4 Green Data Center, owned by DCI Indonesia. Boasting an average network uptime of up to 99.999%, this data center is located in Jakarta and is built with state-of-the-art RAID 10 disk arrays, SuperMicro servers with multi-core processors and SSDs, and a network speed of 1Gbps. After a DDoS attack on their servers a few years ago, they ramped up their protection with extra security systems and BitNinja Smart Server Security, so you can rest assured that your data will be safe. All hosting packages come with unlimited bandwidth and an SSL certificate. You get a one-click installer with over 320 applications including WordPress, Joomla!, OpenCart, PrestaShop, Moodle, and Magento. 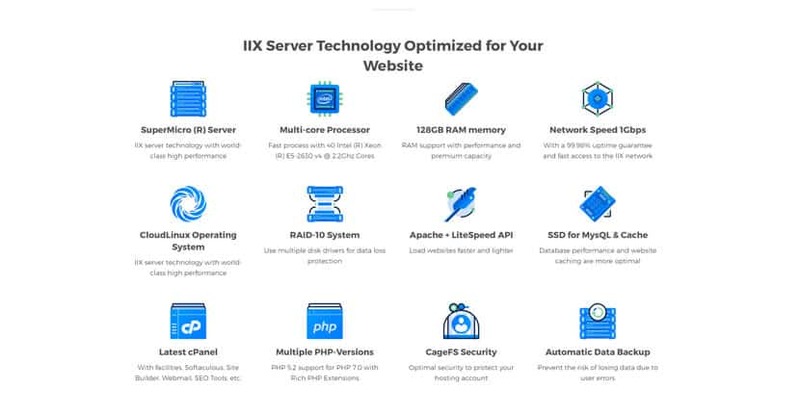 But what stood out to me was that even with their lowest-tier shared hosting plan, they offer their customers access to an easy-to-use website builder and boast an average uptime of 99.98%. Note that this basic package doesn’t include a free domain, nor does it include a dedicated IP address and private nameserver. If you’d like a free domain for the lifetime of your hosting plan, you’ll have to opt for their Student plan or better. Niagahoster also offers Cloud VPS hosting plans, which provide scalability for businesses. These employ Cloudflare’s CDN along with the Nginx Web Server, which accelerates server performance and ensures optimal loading times for your visitors. The Cloud VPS packages include Softaculous’s Webuzo control panel for easy account management: with this, you have full root access and can scale your resources up and down any time you need to. Niagahoster guarantees the lowest prices in town. If you can show them proof that an Indonesian hosting provider offers lower prices than they do, they’ll cut their prices accordingly and offer you a better deal. Niagahoster doesn’t have any free trials or plans, but they do have a 30-day money back guarantee. If you’re unsatisfied with the service at any time within the first 30 days, they’ll refund your payment in full. This policy applies even to their Cloud VPS packages, which, by the way, is a rare offering in the industry. Where they really shine is in their customer support. In the short time that they’ve been in business, they seem to have taken all the customer feedback to heart and are continually improving their service standards. For instance, they used to average a one to two-hour response time for support tickets, and they now average a seven-minute response time. When I accessed their live chat, I was connected to a representative within two minutes. Since most Indonesian hosts falter in this area of customer support, this may explain why Niagahoster has quickly gained so much traction in their local market. With industry-leading customer service standards and superior server performance, it’s no wonder Niagahoster is quickly becoming the most popular choice of web host for Indonesians. Wondering how Niagahoster stacks up against other Web Hosting companies? Enter any other Web Hosting company and we will give you a side-by-side comparison.